Learning and development associate Ricco Ramos providing additional support to a trainee during Computer Immersion Training in the Anchorage Native Primary Care Center. Southcentral Foundation’s RAISE Program began in 1997. The program blends work experience while introducing participants to health-related careers. Located on the Alaska Native Health Campus in Anchorage, new components have been added yearly to accommodate changing needs and innovations. The overall goal is to build future Native leadership, blending cultural components into planning processes. The RAISE Program provides opportunities for on-the-job work experience in the context of Alaska Native cultural values. The RAISE Program’s is founded on the belief that everyone wants to succeed and will respond to expectations when given the opportunity. Its goal is to strengthen the Native Community by enhancing education, life and employment skills, and professional/personal development while increasing health awareness of Native youth. Two former RAISE Program participants have become influential within SCF. Ricco Ramos started as an intern at SCF in the summer of 2005. Ricco was placed in the youth mentorship and health careers group for several summers. Ricco returned in 2007 to complete the Administrative Support Training Program and transitioned into the Development Center as an administrative support. In the five years that followed, Ricco progressed from an Administrative Support I to a level III, and later into a program coordinator. In these roles Ricco provided support to various SCF programs and processes such as the Academic Program, Administrative Support Training Program, and daily course/room management. Ricco has been in his current role as a learning and development associate with the development center for the past three years. Ricco facilitates a variety of trainings and educational opportunities at SCF:RELATE Customer Experience, Cultural Awareness, Core Concepts Group Leader, New Hire Orientation, Electronic Health Records, and Computer Immersion. Ricco presents A Comprehensive Approach to Employee Learning and Development annually at SCF’s Nuka System of Care conference each year. Ricco not only shares SCF’s approach to employee learning and development but shares his own growth and development story to conference visitors and all who ask. Ricco has been with SCF for almost 10 years beginning with his RAISE internship. “Starting with the RAISE program allowed me to build a network of peers and gain meaningful work experience very early on. The RAISE program comes full circle, where I get to work with other employees who were in the same summer cohorts as I was,” Ramos said. Ricco is Aleut and a customer-owner from Anchorage, Alaska. Ricco continues to provide training and education for all employees of SCF. He believes that everyone should continually learn and grow and that providing education and training will support employees to continue to do amazing work at SCF. Another SCF leader who participated in the RAISE Program is Fari Sylvester. She became an intern in the summer of 1998. Fari also interned the winter session in 2000-01 and as a graduate intern session 2002-03. Fari’s worksites included human resources, public relations, transitional living program, and RAISE Program. “The RAISE Program provided me with multiple opportunities,” Fari said. “I was able to become a water safety instructor, emergency trauma technician, and attend college at Haskell Indian Nations University,” she added. Fari has progressed in the organization starting as administrative support, moving to case management support,and then to program coordinator supporting the SCF Board of Directors before becoming a supervisor. Fari is now a supervisor in outpatient pediatrics. 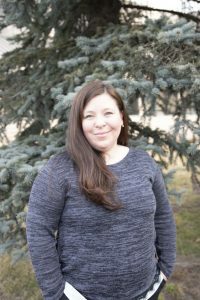 She received an associate’s of arts degree from the University of Anchorage Alaska in 2007 and is currently working toward her bachelor of arts degree in Alaska Native governance at Alaska Pacific University. Fari wants future interns to be open to any opportunity or job placement. Her advice for interns: this is your chance to find out what you want to become when you grow up; the relationships that you create now when working in different areas will follow you throughout your life. Designed to develop leadership skills in Alaska Native and American Indian youth 14–19 years old, SCF’s RAISE Program offers three separate sessions per year: summer, winter, and graduate programs. Each one exposes participants to health-related careers and the expectations of the workplace, while supporting them in both personal and professional development. Ricco and Fari both learned that when opportunities are offered to you while in the RAISE Program — take them and explore the options provided to you and embrace them.